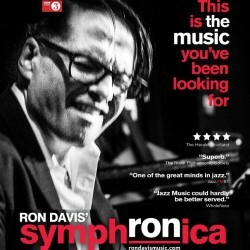 BBC Radio 3 regulars Ron Davis' dazzling SymphRONica return for a fourth Fringe. Led by jazz pianist/composer Ron Davis: 'One of the great minds in jazz' (Jazz FM Radio). SymphRONica is 'an ensemble like no other. Energetic, virtuosic... excitingly unpredictable and fresh... virtuosity and drive' (WholeNote Magazine). SymphRONica has topped the charts with its genre-bending blend of sounds. Original but always accessible, Symphronica has performed to worldwide raves. The Herald and The Scotsman both gave SymphRONica four stars. This is the music you’ve been looking for, the jazz you want to hear!